During these winter days where spring training is still on the horizon and regular baseball is months away, thinking and dreaming about baseball is the way to get through. Which is why the January project for the United Cardinal Bloggers was definitely well-timed. The topic was actually one I suggested: if you could attend any game in Cardinals history, what would it be? And it’s something I wrote about last January, choosing Game Seven of the 1926 World Series. That would still be my top choice of any game, for all the reasons I stated last year. So, for the UCB project, a caveat: if I could attend any regular-season game in Cardinals history, which one would it be? Still so many options. The double-header where Stan Musial hit five homers, or the game where he had hit No. 3,000 at Wrigley Field. Bob Gibson’s no-hitter. One I really thought about choosing: Sept. 8, 1998, where Mark McGwire hit homer 62. And then I had a different idea: what about going back to a game I’d attended, just with today’s knowledge and insight? A serious contender was April 5, 2000 — my first game at Busch Stadium since I was in high school (then a Cubs fan) and the one that sealed my decision that becoming a Cards fan was absolutely the way to go. The Cardinals won 10-4, Jim Edmonds hit his first Cardinals homer, Rick Ankiel pitched two innings in relief since his first start of the year was still several games away and he hit a triple that had the entirety of old Busch, minus my Mom and the other Cubs fans, giddy. 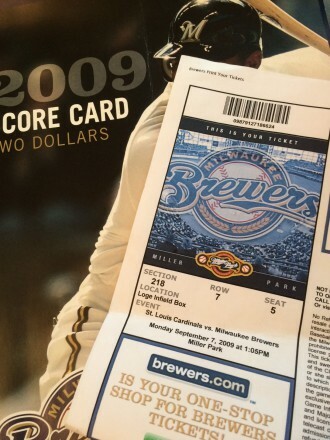 Then I realized the obvious selection: Sept. 7, 2009, Labor Day at Miller Park. My first-ever time seeing Chris Carpenter pitch in person — and it was an absolutely stellar game. Personally, I was just thrilled to finally get the chance to see him pitch. He’d been my favorite player since 2004, yet the fates (and his injury history) had never aligned where he had started the game or two per season I’d attended. So even though my long Labor Day weekend trip to visit friends also included seeing my alma mater, Northern Illinois University, lose to the University of Wisconsin only by one touchdown (it was exciting!) and enjoying the wonderful city of Madison, the trip to Milwaukee and my first visit to Miller Park was going to be the grand finale with my guy on the mound. I had no idea how grand it was really going to be. Our seats for the game were very good, directly behind home plate and just under the pressbox. For my re-trip to the game, I’d like to be behind home plate again — but in the front row. (Oooooh, do I need to make a Bob Ueker reference, given it’s Milwaukee?) And, though I love my lifelong friend Jan and her husband Mike dearly, I won’t attend this time with them. No, just me, so I can enjoy and appreciate the game (and the front-row view). Although it would be cool to have Dathan there — he was at the original 2009 game also, though we didn’t know each other then. And his baseball wisdom could definitely enhance the savoring of the game even more. And this game was definitely one to savor. I have my own scorecard from the game, so I can tell you without even looking at Baseball Reference that CC struck out Corey Patterson to start the game, one of 10 strikeouts he had that day. There was only one hit by the Brewers, the fifth inning one-out double by Jody Gerut. (I also can, since I for some inexplicable reason still remember, tell you that his walk-up song was The Outfield’s “Your Love.” Maybe it was because the very annoying Brewers fan to my left kept singing it each time he was up. So there will be no Brewers fans sitting near Dathan and me.) You also can see that I was so excited about that complete game, 99-pitch shutout I marked Patterson’s game-ending double-play as happening in the eighth inning, after I first marked Craig Counsell’s lead-off walk in that inning too before correcting it. 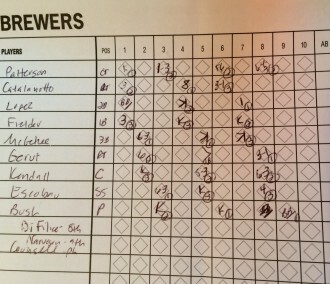 So, since I already have my scorecard from the game, I won’t do that this time. Instead I’ll just watch, and admire — especially the two strikeouts of Prince Fielder, the two called K’s on Casey McGehee, the fact Chris had only thrown 58 pitches through five innings and 80 pitches through seven, since I thoughtfully jotted these down on the Cards side of the scorecard. Oh, right, the Cardinals. There were eight other guys out there, even though all my attention was focused then — and would be focused again — on the pitcher. I certainly had an interesting way of listing them on my scorecard, didn’t I? Skip, obviously, is Schumaker, Rick is Ankiel and next is of course That Guy Who Used to Play First Base, who had a great day — 3 for 4 with a walk plus he drove in two of the Cards’ three runs. 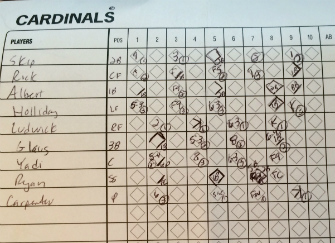 Why those three and Yadi are listed by their first names and the rest — including Carpenter — by their last? Who can explain my thought process at the time? Though of course Yadi is listed as Yadi. He’s always just Yadi. And even though I saw Brendan Ryan get two hits, Troy Glaus get two hits and even Rick get two hits, I don’t remember them now. I will definitely appreciate seeing those hits of Rick’s again, however, as well as the fact I didn’t have to watch him strike out. But, of course, I just want to watch one of the best games of my favorite player’s career for a second time — seriously watch, from as close as I can directly behind the plate. Yes, those curveballs from my original seat were spectacular. They’ll be that much better on ground level. (Well, hopefully — being higher up in my original seat might be a benefit in that situation.) The front row vantage point will likely let me hear those words certainly spewing out of his mouth after he walked Felipe Lopez in the first and Craig Counsell in the ninth — you know there were choice words after that last walk. And how awesome would it be to hear those in the heat of the moment? 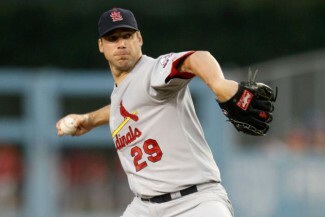 Mostly, knowing what’s ahead in future years, it would be amazing to experience seeing Chris Carpenter pitch in his prime once again. I knew then how fortunate I was for all the planets to align and have such a game as my first in-person CC start. (There was just one other, on Sept. 21, 2012, but I knew he was starting then and purposely attended.) Knowing what follows in 2010 and 2011 and 2012 and 2013 … well, I’m running out of adjectives to describe such a time-traveling experience back to Labor Day 2009. But, damn, it would be nice to sit there at Miller Park, watch Chris Carpenter and see what other words I could come up with. This entry was posted in General Cardinals and tagged Chris Carpenter, Milwaukee Brewers, United Cardinal Bloggers by Christine Coleman. Bookmark the permalink. During the last couple of weeks I’ve been watching old games via YouTube while waiting for spring to arrive. Surprisingly, I found this game there. Fun game to watch. Surprising how young everyone looked! Doesn’t seem that long ago.